Recently, I wrote a post about medieval fabrics that contained some interesting information from Margaret Scott’s Fashion in the Middle Ages. What I didn’t include then were some of the most interesting facts I learned from reading that book. Here are ten fascinating fashion facts for your enjoyment (I’ve saved my favourites for last). 1. Everybody loved straw hats. I’ve often seen illustrations of peasants working the fields in straw hats to keep the sun off their heads, but Scott claims that “straw hats were worn outdoors by all ranks in the summer”. I would imagine that nobles wore fancier versions of the conventional straw hat, but it’s interesting to hear that fashion extended to the practical – sometimes. 2. Sometimes fashion was not so practical. We’ve all seen the long, pointy shoes and long, pointy hats that were all the rage in the fourteenth century. Clearly, those could not be considered useful by any means, which is why it was the idle nobles who sported those articles. Apparently, “in 1366, the French king prohibited the production of long-toed shoes and stockings, in the vain hope that by cutting off the source of supply of the latest excesses of fashion, he could eradicate the fad itself”. No such luck. People loved their pointy shoes. Fashionistas who sported up-to-the-minute headdresses that covered their ears also found themselves missing out on the conversation. Vanity, it seems, required some sacrifices. 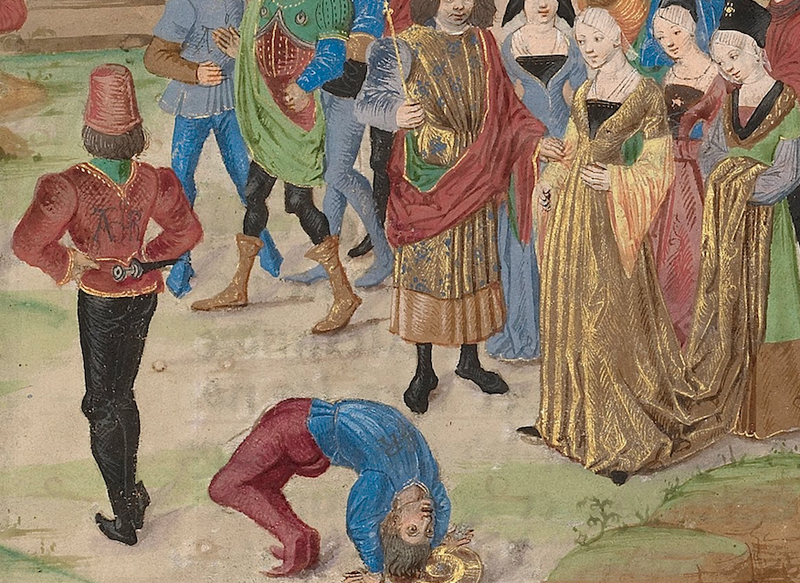 Pointy shoes – Detail of a 15th century illuminated manuscript of Renaud de Montauban. 3. Commoners used accessories to stay hip. Because it took so very long to hand-spin, hand-weave, and hand-sew clothing, peasants could not afford to continually make new clothes to follow changing trends. However, they could, Scott says, have “a passing acquaintance with high fashion in the shape of accessories such as belts or shoes”. Belts would be something that could be bought at an annual fair, where peasants could also see how the most fashionable people were now wearing their belts (high up, at the waist, or low on the hips). 4. Sheep were versatile creatures. Although I often think of “natural”-coloured fabric to always be off-white, Scott says, “undyed sheep’s wool… could be used to create fabrics in hues ranging from near-black via brown to gray and off-white”. This would be handy for those of humble religious orders who wanted distinctive habits, but who also wanted to avoid being seen to buy expensive, dyed fabrics (a criticism levelled by the Franciscans against other orders). 5. Doctors cut striking figures. While it would have been easy to spot a noble at a glance because of his or her clothing, there were other categories of dress which made it just as easy to spot people in different categories. For example, Scott mentions that from the fourteenth century on, scarlet clothing was to be worn by a “doctor of any university subject”, and that “in Paris… those who taught medicine at the university were required from 1350 onward to wear good-quality, violet-coloured cloth”. The well-educated were not meant to be fashionable – and they were definitely not allowed to wear green – but they were certainly meant to stand out of the crowd. 6. Those multicoloured outfits we always see medieval servants wear actually have a name. Servants in noble houses were usually required to wear livery in the colours of their patrons, and those outfits that were “split vertically into halves of two different colours” were called “mi parti”. Scott says the colours the servants wore signified rank, at first, and later simply household. 7. The clothing created for ceremonial occasions was supposed to be like that of “the good old days”. Ceremonial clothing was special, and often created just for one event. Scott says, “Many of these garments had once been fashionable, but they became items retained for occasions when currently fashionable dress might have seemed too ephemeral”. Instead, the clothing worn was meant to imply unbroken tradition by hearkening back to times of yore. After wearing a fabulous outfit at one high-profile event, some nobles felt it would reflect badly on them to be caught in the same outfit at another. But what could be done with such sumptuous pieces of clothing? For one thing, a person could give his or her hand-me-downs to the church to be turned into vestments. That way, the expensive clothing could be used to elevate the look of high-status priests, and the donations would reflect well on the donors, perhaps earning them a few extra prayers. Why put on socks and shoes when you can save time by just putting on socks? According to Scott, fashionable Italians around 1400 didn’t bother wearing actual shoes, but wore “stockings with leather soles” instead. It just goes to show that all of our most wonderful ideas come back around every few hundred years or so. 10. Only the nobility had buttocks worthy of show. Like twentieth-century skirts, medieval tunic lengths moved up and down as fashions changed. In the Late Middle Ages, tunics were very, very short, but only for those with the worthiest buttocks. “In England in 1463,” says Scott, “the wearing of short tunics that revealed the male buttocks … was restricted by law to the upper classes.” Peasant posteriors were simply too vulgar to contemplate, let alone see. While these are my favourite facts from Margaret Scott’s Fashion in the Middle Ages, it is definitely a worthwhile read, with beautiful, full-colour pictures of all these fun fashions for anyone interested in the Middle Ages – or noble buttocks.